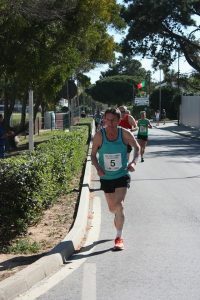 Barrie Roberts reports: A ‘puddle of teal’, Martin Foster and Barrie Roberts (and supporting cast of Marie Foster and Katie Roberts) were in attendance at this year’s Falesia 5k Road Race. Martin Foster, in a very competitive age category, completed the distance in a time of 25:19 (his best time for 5 years on the Falesia Course). Barrie Roberts repeated his age category win of the previous year and crossed the Finish Line in 26:26. The three lap course is on quite a steep incline, and the sun and warm weather ‘took its toll’ i.e. Most participants were slowing down by the last lap! There were 148 finishers, and many good/respectable times achieved. In this latter connection, first runner home was Ross Braden, Blackheath and Bromley, in a time of 15:32. First Lady home was Tabea Themann, HH Running (Germany) in a time of 17:45. Ann Hughes FV 70 cat winner was last to complete the 5k distance in 43:04. The BvH Portugal Boot Camp (unofficial) may take place again next year if there is sufficient demand. An excellent venue for warm weather training.